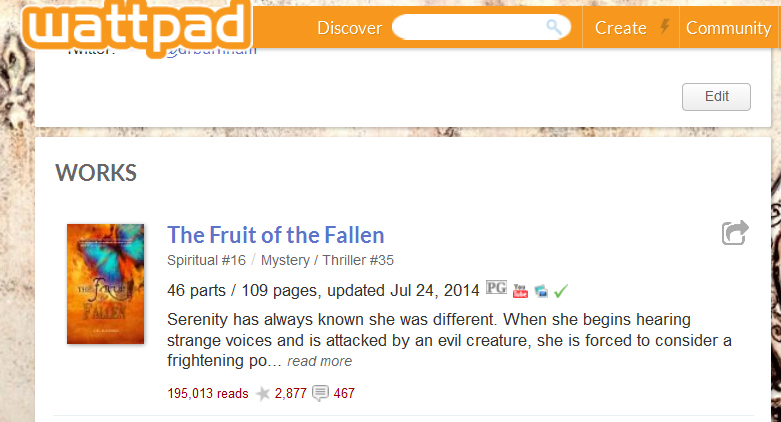 Almost to 200,000 reads on wattpad.com for THE FRUIT OF THE FALLEN! Why is this significant? 200K is the threshold for the bright red number indicator. In short, the change in color will mean my book is HOT! What a journey it has been since first hearing about wattpad at a publishing seminar I attended at Stanford University. The publishing industry is changing, at least different doors have been opened, or holes busted through the walls if you have some publishers, and wattpad is providing writers an opportunity to squeeze through one of these new openings. Sitting in the seminar taking notes with one hand, my other hand was creating an account and uploading my first chapter. Done. I had a page with my first chapter and a profile pic the same as my book cover, well almost, at least as much as I could fit. I’d change this later. I was one of two million plus aspiring writers with a story I was willing to give away in order to build a “platform” and gain the attention of an agent or publisher. Ha! It seemed like one might as well skip a rock across a pond and have a baseball scout offer a major league contract. Hey! It’s going to happen to someone, so it might as well be me, right? And It had already happened to a couple writers, even a teen girl not even out of high school. Where does one start? By waiting. And waiting. Then, one begins to interact, write, share, write some more, make corrections, leave reviews, join book clubs, interact, adding a chapter a week, all the while building a small network of readers. It was hard work getting a foothold, but I made it. THE FRUIT OF THE FALLEN became a featured book. I’ve befriended accomplished writers, most notably Lauren Kate, author of the FALLEN series. Now I wait for those beautiful scarlet red numbers to appear. Less than 5K more reads. What a journey. What an accomplishment, But, it is only the beginning.